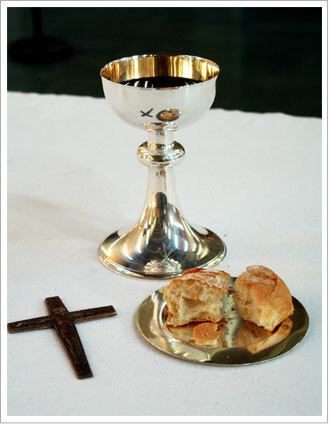 The Eucharist is the culmination of Christian initiation. It is referred to as “the source and summit of the Christian life”. It is in the celebration of the Eucharist that we are nourished with Christ’s Body & Blood so that, as we receive this “food for the journey”, we might share in everlasting life. In order to receive the Holy Eucharist, a child must first be baptized in the Catholic Faith. If a child has been baptized in another Christian denomination and now wants to become Catholic, the child will need to make a profession of faith to be received into the Catholic Church prior to receiving First Holy Communion. Typically, reception of First Communion takes place at the end of the Second Grade year after having completed two years of catechetical instruction either in our Catholic School or in our Religious Education Program. However, a person may be prepared to receive Holy Eucharist at any time from 2nd Grade on into adulthood. Parental participation is required in the preparation of their children for the sacraments. If you recently moved from another town or parish where your child was previously being prepared for the sacrament, please provide a letter from the previous parish verifying your child’s enrollment in religious education. A copy of the child’s baptism certificate should be given to the Director of Religious Education so that we may send notification of reception of the sacrament back to the church of baptism. Public School Children needing preparation should register for religious education classes in the fall. Download Religious Education Registration Form here. Adults needing the Sacrament of Holy Eucharist participate in the process called “The Rite of Christian Initiation of Adults” (R.C.I.A.). Visit the RCIA page.